Atarax, which has a generic name of hydroxzine, is used in allergy treatment for reducing the activity in the central nervous system. As an antihistamine it works to reduce the natural histamine that is produced by the body. That is a chemical that causes symptoms such a sneezing, runny nose or hives on the skin. Atarax is also as a form of sedative that can help with the problem of anxiety and tension. And it is also used together with other medications that are given as a form of anesthesia. In addition, hydroxyzine is also used to treat allergic skin conditions like contact dermatitis. 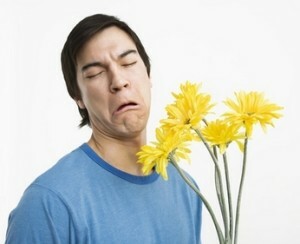 And may have other purposes that are other than related allergy treatment. One should not use Atarax if allergic to hydroxzine. Should on suffer from any seizure disorder, liver or kidney disease. 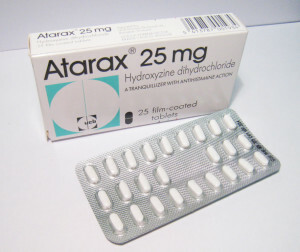 With Atarax one can also possibly experience the problem of side effects. These can be things like having one’s reactions and thinking impaired. One needs to be careful when driving and also doing anything that demands one’s full attention and awareness. Should any problems take place such as tremors, confusion, seizures, restless muscle movement in eyes, tongues, jaw or neck, one should contact the doctor right away. Also one should not consume any alcoholic beverages while using Atarax since it can increase the risk of side effects. Atarax is not be used by a pregnant mother. And the doctor will need to possibly alter the dose should a person suffer from certain conditions. These would include epilepsy, asthma, emphysema, glaucoma, heart disease, stomach ulcers, thyroid disorder, enlarged prostrate, liver disease or kidney disease. Older adults are more often likely to experience side effects from using Atarax. Thus they will need to be more careful about noticing any possible side effects. This medication is known to be harmful to unborn babies. It is not known if hydroxyzine is passed on through breast milk or could harm a nursing baby. Therefore, Atarax is not to be taken by a nursing mother without checking with a doctor. And any woman who is expecting or thinks she will be come pregnant needs to be sure she informs doctor before taking the medication. This medication is to be taken as prescribed. One should never alter the usage without a doctor’s permission. And always follow the instructions that are listed on the prescription label. Atarax is to be taken with a full glass of water. This is to be taken by the use of a dose-measuring spoon and not some cup. If one doesn’t have one then it can be obtained from the pharmacist. Atarax is supposed to be stored at room temperature and somewhere it is not exposed to either moisture or heat. And should a person accidentally take and overdose or have any problem with the medication in anyway the doctor should be called immediately. Thus the person should never guess with the way the medication is used or how some change in usage will be a problem. There are several possible side effects the use of Atarax. These can include things like tremors, confusion, seizure, restless muscle movement or seizures. In addition one might also experience the problems of dizziness, drowsiness, headaches or blurred visions. Should one have any signs of a reaction to the medication he or she should contact one’s health provider immediately. This will be very important if one has problems with breathing or swelling of face, lips or throat. In those cases one needs to stop using Atrax and call the doctor right away. And there may be other side effects than those that are mentioned above. One’s health care provider will be able to assist with clarifying and explaining all the problems one might have.